After Father Gruner’s death on April 29, 2015, the most frequently asked question has been “Do you have a priest yet”? Well, the answer is YES! But not just one, we have a council of priests! After Father’s death, a number of priests who supported Father and The Fatima Center in this work over the years came forward and offered to help while Our Lady’s apostolate searched for a priest to assume Father’s role. We are grateful to these priests for the help they have given. The offers of assistance came from ecclesiastics filling varying roles in their priestly lives and served as a testimonial to the efficacy of Father Gruner’s continuous explanation over the years that the Message of Fatima is meant for all. Father Gruner never made an issue of someone’s religious status or understanding. Because he believed that Our Lady’s Message is meant for all, he allowed no barriers to interfere with his work. As a result, Father and his work were respected by many belonging to what might be referred to as different factions within the Church. That Father’s methods of promoting the Fatima Message affected many Catholics around the world, regardless of where they were in their personal understanding and practice of the Catholic Faith, was witnessed on the day of his funeral. Many of the attendees at the solemn Requiem Mass belonged – by their own descriptions – to different factions. Ordinarily the members of these various groups avoid spending any time in the same room and instead spend a great deal of time fighting against each other. But for that one part of a day, bishops, priests, religious and laity put aside their differences and came together for something they had in common – the desire to pray for the repose of the soul of Father Gruner and show their respect for the work he had done for decades. They respected that Father Gruner promoted the Message of Fatima and defended the Catholic Faith always with charity and never made an issue about who was in what “corner”. The fact that a number of the attendees were from different factions was duly noted and commented upon by some that very day and afterward as well. It was a testament to Father’s wisdom and charity. Likewise, the priests who have come forward to lend their support in the continuation of Father’s work, have also come from different “corners”. Recognizing this, we – those of us whom Father left behind to continue this work – understood that we must follow through with what Father had established over the years, continuing to promote the full Fatima Message in the same way – allowing no barriers in reaching out to others. We decided that whereas no one priest could ever take Father’s place, we must utilize what Heaven is providing for us and form a council of priests – specifically an advisory council of priests. So approximately 18 months ago, we asked priests who had helped Father Gruner with his work over the years to become a member of this new council we were forming. Four priests have agreed to be members of the advisory council. These priests help in a variety of ways: giving spiritual advice, answering questions about the Catholic Faith, promoting the Fatima Message by speaking at the Our Lady’s Army of Advocates conferences and other events, assisting with content approval of new literature created at the head office, leading pilgrimages, writing articles for publishing in The Fatima Crusader, visiting on-site to offer Mass and more. 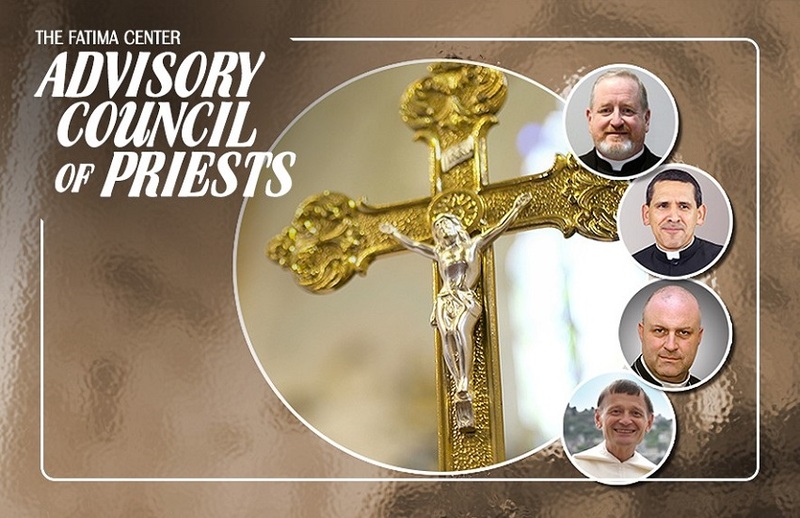 In addition to the priests who agreed to be on the council, there are other priests who, though unable to join the advisory council at this time, still assist us as much as possible in a variety of ways, as needed. Below are brief introductions to those on The Fatima Center Advisory Council of Priests. We know that no one can take Father Gruner’s place, but these good priests have come forward to support the continuation of Father’s work and to provide us with their expertise in areas where we can use their wise counsel. Msgr. Patrick Perez has been a good friend to Father Gruner and Our Lady’s Apostolate for more than 20 years. Professor of Theology and Liturgy with a profound knowledge of the history and development of the Roman Rite of Mass and an expert on the modern errors against the Catholic Faith, Msgr. Perez holds his degree in Theology from the Pontifical University of Maynooth in Ireland. He served as Rector of the Institute of Christ the King seminary in Italy for a year before undertaking pastoral work in the United States. Over the years, Msgr. Perez has hosted, attended and spoken at many Fatima Center conferences and events and written articles for The Fatima Crusader. We are happy to have him on our council and will continue to rely on his wise guidance as we continue on. Fr. Albert Kallio, O.P., is a professor at Our Lady of Guadalupe Monastery in Silver City, New Mexico. He met Fr. Gruner in 1979, actively seeking Father’s advice regarding his vocation while in the seminary. Father Albert entered the Dominican Order in France in the late 1980s and was ordained a priest in 1994. Over the years he kept in touch with Father Gruner whom he credits with helping him make the right decision and thus agreed two years ago to be part of our Advisory Council of Priests, saying “Yes, I would be willing to be on this council, to honor Our Lady of Fatima and also repay the debt of gratitude I owe Father Gruner”. He has travelled the world preaching the Order’s mission, particularly about Our Lady and consecration to Her. Most recently he served as pastor at Our Lady of Peace Church in Vernon, British Columbia. He has spoken at various Fatima Center conferences and he hosts our Q&A Fatima TV program: Ask Father. We are happy he agreed to be on our council and continue to rely on his help in doing this work of spreading Our Lady’s Message. Father Paul McDonald was Ordained in 1988, and is currently pastor in a diocesan parish in Chippawa, Ontario, Canada. Father McDonald was a very good friend to Father Gruner and Our Lady’s Apostolate for many years. He came to know Father Gruner while still a seminarian. Fluent in French, he helped The Fatima Center with the translation (from the original French) and publication of the monumental three-volume set The Whole Truth About Fatima by Frère Michel de la Sainte Trinité. Since Father Gruner’s death he has helped in a variety of ways, including offering the Tridentine Mass at our apostolate chapel, writing articles for The Fatima Crusader, doing short programs for our Fatima TV, and speaking at Our Lady’s Army of Advocates Conferences. Stationed within twenty minutes of The Fatima Center offices, his close proximity makes him an ideal priest on our apostolate Advisory Council and we are grateful for the help he gives. Father Michael Rodríguez is a traditional Catholic priest from El Paso, Texas. He studied in Rome and was ordained in 1996. He has served as pastor for a number of churches in his diocese, as well as vocations director. He speaks fluent English and Spanish, and is proficient in German and Italian. Father Rodríguez has spoken at a number of Our Lady’s Army of Advocates conferences, conducted The Fatima Center’s first Marian Retreat in Lewiston, New York in 2017 and was the spiritual guide at The Fatima Center’s pilgrimage to Fatima in the centennial year of Our Lady’s apparitions, July 12-22, 2017. We are grateful for all he has done and welcome his continuing counsel in the future. Please pray for the members of our Advisory Council of Priests and all the clergy who have supported and assisted Our Lady’s apostolate over the years, especially those in the last 3 years since Father’s death. Joanna Swords is a long-time supporter of The Fatima Center, and one of the initial Fatima Center volunteers. She has a Bachelor of Science Degree in Nursing. After working as a Registered Nurse for nearly 23 years, she left her nursing career and came to work for The Fatima Center. Over the past 20 years she has worked in a variety of different areas, including developing and managing the apostolate Volunteer Department, management of shipping and international distribution of Fatima Center literature, opened and/or coordinated the management of a number of North American and international offices, served as events coordinator, and developed and created new literature for the apostolate. She also has conducted workshops, presenting at a number of Our Lady’s Army of Advocates conferences. She currently spends most of her time on writing projects, updating apostolate literature and developing new literature, and still oversees the North American and International Volunteer Departments.